Trading fees: $1 per contract capped at $50 (cap does not apply to in-the-money trades). Wire transfer and returned check fees: $25. Nadex is very different from the other binary options brokers we have reviewed on this site. 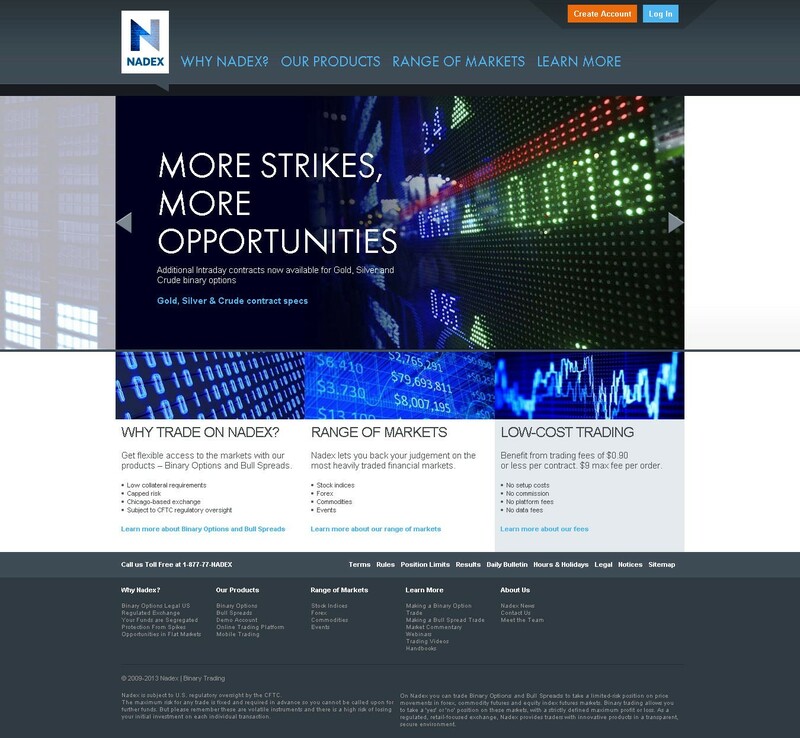 Nadex stands for the North American Derivatives Exchange, formerly known as HedgeStreet. The current owner of the company is IG Group, and it is based in Chicago, Illinois. Not only does the company accept US traders, but its services are geared toward US traders specifically. The site is only available in English and you can trade only in US Dollars. So this is not a good site for global traders, but it is an excellent choice for US traders. What sets Nadex apart from all the other binary options brokers around the globe? Only few binary options brokers are actually regulated as such and not as something else (i.e. a gambling commission or a private bank). And NADEX is not even a broker per se but an exchange. Nadex is regulated by the CFTC and all applicable US laws. As such, it is exceptionally trustworthy. If it is important to you to know your money is secure, Nadex is probably your best bet. All funds are segregated, and the company even tells you where they are stored. And since you know that they have to abide by US laws, you can feel safe and assured while trading with them. Nadex offers free demo accounts to US residents. You are allowed to demo test for as long as you like, and all you need to sign up to play with $25,000 in practice funds is an email address. You definitely should sign up for a demo account before you sign up for a live account and make a deposit. The reason for this goes beyond the simple need to test trades before trading live to make sure your system works. The Nadex platform is proprietary and it is very different from other online binary options platforms. You will not be able to learn how to use it while trading with real money without losing some. You absolutely must take some time to learn using virtual money or you will make mistakes. There are lots of amazing features on the platform, however, including a ton of different indicators you can place on the charts. Customization is a huge part of Nadex’s offerings. To sign up on Nadex, you only need an email account for a demo account. You will need to provide your social security number and other identifiable information for a real account. You would need to deposit at least $250 to get started, using E-check, wire deposit, or a paper check sent through the mail. Nadex offers 28 different trading instruments, including currencies, commodities, stocks indices, and occasional events. Events offer you a new and exciting way to trade the news. While we were only able to find references on-site to trading High/Low, we found a number of references around the internet stating you can also do Boundary and One Touch trades (though this may be for spreads, another service Nadex offers). Trading with Nadex is very different from other binary options sites. You do actually have to purchase contracts to trade. As such, you have to do a mathematical calculation every time you trade (though the software will display it for you) to figure out the maximum profit or loss possible with a given trade. The tick value is $1. There is a page on the site which tells you all the contract specs. The smallest units we saw available to trade were 0.1 tick size x 1 contract. This is theoretically equivalent to a dime. All trades expire in or out of the money, with values defined at 100 or 0. You have to calculate price movement against that scale, multiply that movement by the contract size, and multiply that value by the tick size. This is slightly different for each type of asset. There are examples on the site explaining how calculations are managed for commodities, currencies, stock indices. Another thing which new traders need to know is that Nadex does charge fees, and they are pretty expensive. The fees aren’t just for wire transfers and returned checks ($25 each), but for trading as well. The fees add up to $1 per contract capped at $50 (no cap on in-the-money trades). Settlement fees are equivalent. So you have to calculate that into your money management plan. This makes trading less accessible to traders with small accounts, despite the fact that you can open an account with only $250. Resources and tools on Nadex are outstanding. When you join the site, you have access to webinars, handbooks, how-to pages, and trading videos. After you open up a demo account, you will receive an email which gives you access to webinars which teach you how to use the demo platform. There is also market commentary on the website, and several cool trading features: limit orders, early closure, and protection against market spikes. Customer service is not available via live chat, unfortunately, but you may reach an agent through phone, email, or paper mail. Is Nadex right for you? It depends largely on how serious you are about your trading. If you are in this to gamble for fun, you probably want to trade with a binary options broker who gears their services toward traders who are more casual. You would find Nadex a bit overwhelming, especially with all the calculations involved. If you are a serious trader, however, Nadex is one of the best choices out there. You will have to take the time to learn to use the platform, but if you aren’t willing to do that, you aren’t really serious. The customization, trading tools, indicators, charts and other features really set Nadex apart, and so does the fact that this is binary options exchange, which is actually regulated by the CFTC. I really like Nadex and the experience so far has been okay. Like with all Binary brokers, you need to make sure all the bases are covered in your account. If anything is off by a hint, they will lock you out until resolved and you may feel this may be in the favor of the company and not you…isn’t that always the case? They are still under regulation of the CFTC, but understand like any arbitration or disputes, a certain dollar amount has to be involved to really be serious. I would say that the customer service is okay for the most part. However if you are an experienced trader and have questions that their ‘specialists’ don’t know the answers to, they sometimes have a habit of becoming irritated. Maybe due to the influx of calls. All emails to customer support do not get an actual reply. They will be acknowledged by the automated mail system, but sometimes that is it. Maybe due to the influx of emails. Their trading platform is acceptable, but once again, if you are an experienced trader you might notice a lack of sophistication that may have you wanting more feedback. This of course is my personal opinion. Execution during both high and low volume(which is not directly given) can be a bit loose. By agreement the contracted mkt makers(2 of them. I’ve researched that some contracts are specifically traded by either or not both, but the customer sup says otherwise.) The spread during a settling market will remain at ten dollars apart. Again, by contractual agreement Nadex requires the mkt makers to do so. However, Nadex publicizes that their profit is not made from the spread and only is made per contract execution fee. Order fills are sometimes a bit loose. Maybe due to latency, not sure once again and is just my experience. How quick are the withdrawals to received the money? I traded on Nadex for about three months. I was new to Binary Options and really learned quite a bit. 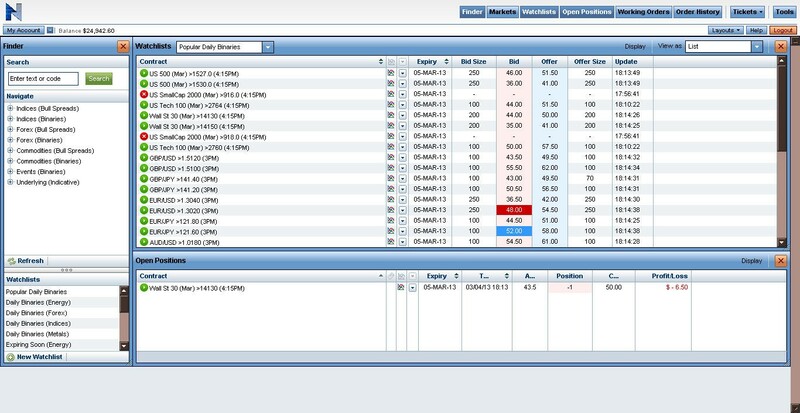 I did all my learning of Binary Options on Nadex. I recommend Nadex because they are a full service site. Not only can you learn how to trade, but Nadex offers videos to help you learn. At Nadex, you are in charge of your trades. You make the trades. Other Binary Options companies, you release your money to the broker, and the broker or staff member makes the trades for you. I would suggest to any aspiring trader to learn the business on Nadex, and then, if you want to let a more experienced person trade for you, then use the services of a broker. This way, you learn the business and can talk intelligently with the broker that is managing your trades. Please note that Nadex is a regulated, US, broker based in Chicago, Illinois. Many brokers are overseas in Europe, England, or Australia. I hear that Finpari.com is a good company. But you will have to judge for yourself. Best of luck. I am a beginner and all those reviews who praises it and suggest it for other newbies are clearly paid by nadex. all of them left out the real details about the platform that will surprise you and cause ur initial deposit to be gone in few trades. They are lot more rules and traps to learn than regular BO. as this site mentions in the vague review above the minimum trade says $1. Wow that sounds good but guess what every trade and positions cost $1. So really no reason to trade $1. Unless u r experienced and know what u r doing and be as quick as the other pros. U would be lucky to conatantly get anything under $70. there is more but I dont recommend beginners to get in. And btw the DEMO is way easier than the live version. I was making awesome profit on demo then live chewed me up in 4 trades Down to 11 dollra. The only thing I can do with that is buy a contract 99.99% guaranteed otm. I mind as well just hand them my money.